In any kitchen, you can always find aluminum cookware like aluminum pots and pans. While commercially made products are readily available to clean aluminum materials at home, many other options are effective and cheaper. Also, if you are not a fan of store-bought aluminum cleaners because of their chemical content, you can opt to use homemade aluminum cleaners. What is a good homemade aluminum cleaner? When making your DIY aluminum cleaner, always remember not to use any alkaline ingredients. Examples of alkaline containing products include baking soda or ammonia. Baking soda may be a versatile all-around cleaner, but products like this are harmful to aluminum items because they can leave spots on the aluminum surface and discolor them. So, if you are thinking about what is an excellent homemade aluminum cleaner, consider using mildly acidic products to clean aluminum. Why Use Homemade Aluminum Cleaners? Here are five easy ways to make natural cleaners for getting rid of tarnish, grease, and rust from your favorite aluminum utensils, cookware, furniture, and other aluminum products. Vinegar offers versatility in cleaning various materials. Lemons work as a natural cleaner and freshener for all types of aluminum items. You can use either of the two for cleaning aluminum items at home. Fill your aluminum pots and pans with water and bring to a boil. For every four cups or quart of water, add ½ cup of the cleaning agent that you want to use, either white vinegar or lemon juice. Continue to let it boil for around ten minutes. Discard the solution, let the pot cool, and wash the pans or pots the same way you clean them regularly. If grease and stains are tough, you can use steel wool, especially for cast aluminum pots or pans. 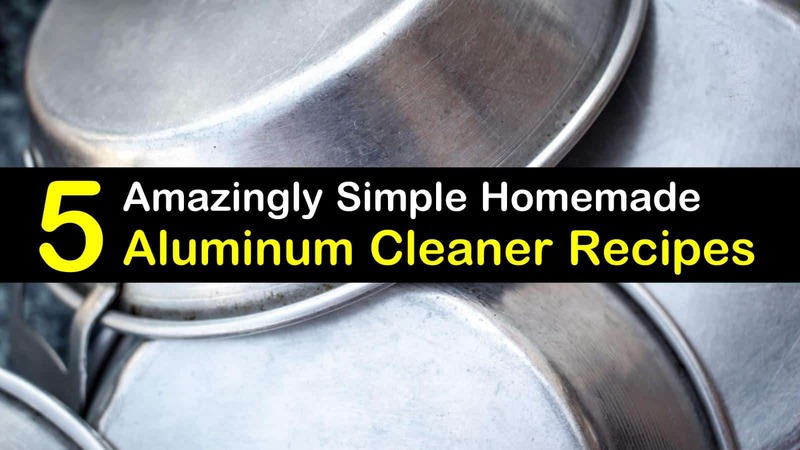 For aluminum household items that cannot be boiled over the stove like aluminum pans or pots, you can make a homemade aluminum cleaner solution. Mix equal parts white vinegar and water and pour the solution in an empty spray bottle. Spray it on your aluminum items at home and wipe it clean with a soft cloth. This solution has two years of shelf life. You can also use this recipe for household items that are made of stainless steel because vinegar also works wonders as a natural stainless steel cleaner as well. Merely use a cloth and utilize it like your regular cleaning products. If your car wheels have aluminum rims and they need some cleaning, make some DIY aluminum wheel cleaner for grease, dirt, or stain removal on your aluminum rims. To use this homemade aluminum wheel cleaner, mix equal parts water and dishwashing soap. Soak the sponge but squeeze the excess water out until it is damp. Use a fine grain sponge or green scrubber and to clean the aluminum rims. The fine grain scrubber or sponge is slightly abrasive, which will clean the grime off the aluminum rims. Run the scrubber around the rims several times as needed. Rinse thoroughly and let dry. If you have aluminum blinds for your windows at home, and vacuuming does not work to keep the dirt and grease off them, here is an easy way on how to clean window blinds that are aluminum. Prepare the following ingredients, concoct an aluminum cleaning solution, and spray it on your window blinds. Pour all ingredients into the glass spray bottle. Put the lid back on and shake well. Spray the solution and wipe the dirt on each slat of the blinds with a damp cloth. If you are cleaning a lot of aluminum blinds, take them all off the windows, place them in the tub, and soak them in the solution. Let them sit for five to 10 minutes before washing the dirt or grease from each slat. Rinse well. You don’t need to spend a lot of money to buy an aluminum polish to shine aluminum items at home. The ingredients to make this recipe are typically available in every household. Use the following household items to bring a shiny finish to an aluminum surface. Mix the white vinegar and water and pour the solution on an empty spray bottle. Spray it directly on aluminum surfaces at home that you want to clean and wipe with a soft cloth. To restore the shiny look of aluminum, take two tablespoons of cream of tartar and pour it in your cup of hot water and mix the solution until a thick paste forms. Rub this mixture onto the aluminum and polish the surface using the buffing pad. To remove the residue, wipe with a soft cloth. These homemade cleaners are all natural, and the ingredients are readily available for house cleaning. They have a long shelf life, and you can use them at any time for home improvement. Unlike commercial aluminum cleaners, these home remedies for cleaning aluminum furniture and other products are chemical-free and safe for use at home so you will never worry about your pets or children getting harmed with toxic substances from your cleaning products. 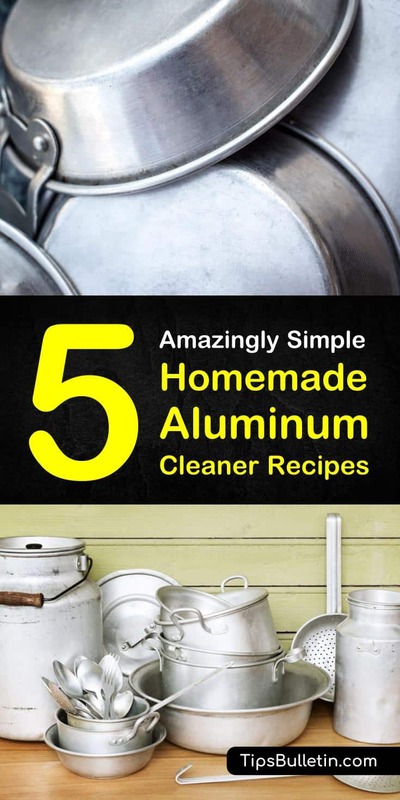 If you found these DIY aluminum cleaner recipes useful, please share these simple cleaning solutions with your friends on Pinterest and Facebook!